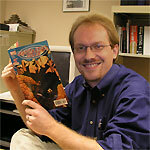 Back around 2006 (when I still had hair) I was spending between $25-$30 a week at the comic book shop. Mostly monthly pamphlet books, but an occassional graphic novel here and there as well. In mid-2008, I had to quit buying comics entirely for financial reasons. I switched over to webcomics so I could still keep abreast of the medium without having to spend money I didn't have. Webcomics, as you're probably aware, tend to comic in more frequent updates than once a month. Some are daily, some are weekly, many are something in between. Because of that, they also tend to be in smaller chunks. A page or two at a time. You wind up with more of an ongoing diet of comics, rather than a single meal. Sometime in there, I got my finances straightened out, and could afford to buy comics again. But the monthlies I had been getting were too far removed for me to really get into. (I noted back here how insular continuity has apparently become.) So the comics I have started gravitating to were more independent graphic novels. Longer stories with a definitive beginning, middle and end. Where I can sit down for an hour or so, and read through a complete story. It occurred to me recently that because I've been focusing on those two forms of comics -- the super short form webcomics and the long form graphic novels -- I really don't even have a desire to pick up a monthly book these days. There's a handful of things out there that do indeed sound interesting, but they're limited series and I'm content to wait for the trade. Part of that is my schedule. There's the whole "employers are eeking more work out of fewer workers" thing that keeps me busy in the day job, but when you add in my "extra-curricular" stuff, I find my free time tends to be in discreet chunks that may or may not occur with any regularity. So keeping up with a monthly ongoing title would be difficult. As I said, it's only a recent realization that I no longer don't buy monthly floppies because I'm not interested in much of what's being presented in them (i.e. superheroes) but I'm just not even really partial to the format in the first place any longer! Yeah> I totally know what you mean...Internet comics seems like my preference...for lack of time. I just never have the time to go down to the LCS and really peruse the shelves. Even if I do go , I go on recommendation and generally look for OGN or compiled books. I think that is the wave of the future, I've been thinking and doing webcomics/internet/iphone comics for the last 5 years on that assumption. I'm banking on the idea that there are more people like me than those who are willing to go down to the LCS and buy Marvels and DC's latest superhero shindigs.